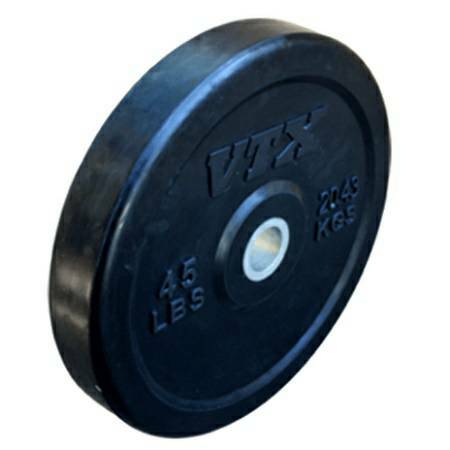 Troy VTX 45 pound oly bumper plates are arguably the best in the industry. Combining great quality bumpers with an unbeatable price. On top of that, a 1 year warranty against breakage gives each user peace of mind. Don't be fooled by these low prices. 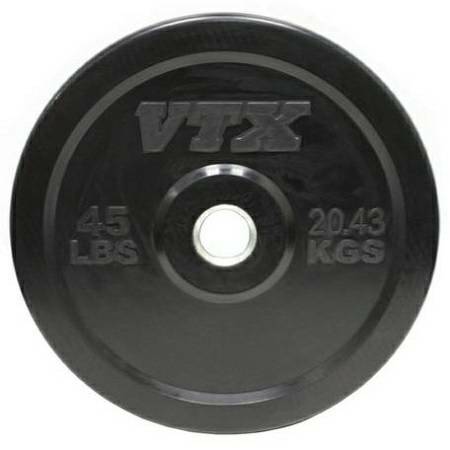 These VTX bumper plates are used by Crossfit gyms throughout the USA and they are well known for their high quality, low bounce, and outstanding durability. Hooked Steel insert that is designed to far outperform the brass bumpers used by the competition. A Hooked steel insert will take much more abuse without malformation and it is machined to exact tolerances to fit all high-quality Olympic bars. Solid Rubber formulation that combines the ideal mix of low bounce with high durability. Some bumper plates bounce too much making them potentially unsafe. Other bumpers are too brittle- and they easily chip and fall apart. Thinner than many of the competing bumpers so you can load more weight on your bar. All VTX Bumpers have the same standard diameter. You can mix and match to load your bar.